(ĐTTCO) - The loss incurred by the PetroVietnam joint venture in Venezuela is still mired in controversy. To get an independent view on this issue, Investment & Finance asked Professor Tran Ngoc Tho to analyse data from 2006 to 2010. PetroMacareo, a joint venture between Petro Vietnam (PVN) and Venezuela (PDVSA) was established in 2006 for exploring for oil in block Junin 2 of the Orinoco area in Venezuela with a capital of US$12.4 billion. It was funded 60 percent by debt and 40 percent by equity. The signing bonus that PVN paid for joining this joint venture was $584 million. Some people said this signing bonus was just half of what US and Russian companies paid and Venezuela did Vietnam a favor. But this is not true: the real reason for those amounts was that the reserves of Junin 2 were only half of what the US and Russia projects had. In 2013, after paying a total of $442mn on two occasions, the project was postponed without any exploration for oil. The Venezuelan economy grew well in 2002-08. Combined with the huge oil reserves in Orinoco, Venezuela at that time was one of the most attractive places in the eyes of top international oil and gas companies from the US, China and Russia. However, Venezuela also faced some problems. In 1998-2010, though its ratio of public debt to GDP was only 50 percent, it tripled and was two times that other Latin countries. Look at it from any angle, it is hard to explain why PVN invested in Junin 2. This leads us back to the old question: Can anyone splurge its money just because it is a state-owned company? The growth in public debts worried investors. The skyrocketing of public debt was the result of serious mistakes of the Venezuelan government in managing its oil revenues. In the 1990s the average inflation in the country was 50 percent. In 2007, around the time the Vietnam-Venezuela joint venture was established, the IMF forecast inflation to reach 25.7 percent in 2008 and 31 percent in 2009. The rates were seen as the highest in the world. The high inflation caused negative real interest rates and a huge depreciation of the currency. During this period, Venezuela ranked 162nd out of 179 countries in lack of transparency and corruption. The policy to cut 3 zeros from the currency in 2007 (and again in 2018) was an obvious sign of the risks that needed to be considered when making a decision to invest in Venezuela. The government explained that the policy was to tame inflation and improve the value of the currency. “This is a strange policy,” some economists said. In its 2006 story Oil’s Dark Secret, The Economist magazine said PDVSA was the company with the worst corporate governance in the world. PDVSA fired some 18,000 experts and managers who had contributed much to building its reputation and replaced them with 100,000 others who were favoured by the government. After this Monaldi, a petroleum expert at Rice University in the US, warned that PDVSA might never have a chance to recover. Since 2004 PDVSA has stopped submitting financial statements to the US’s State Securities Commission. Unlike other industries, the financial statements of petroleum companies have to include all information about oil and gas reserves, future cash flows, sunk costs, capital allocation plans, and so on. The failure to furnish the financial statements created more risks for PDVSA’s partners. After this, most international credit rating institutions refused to rate PDVSA. 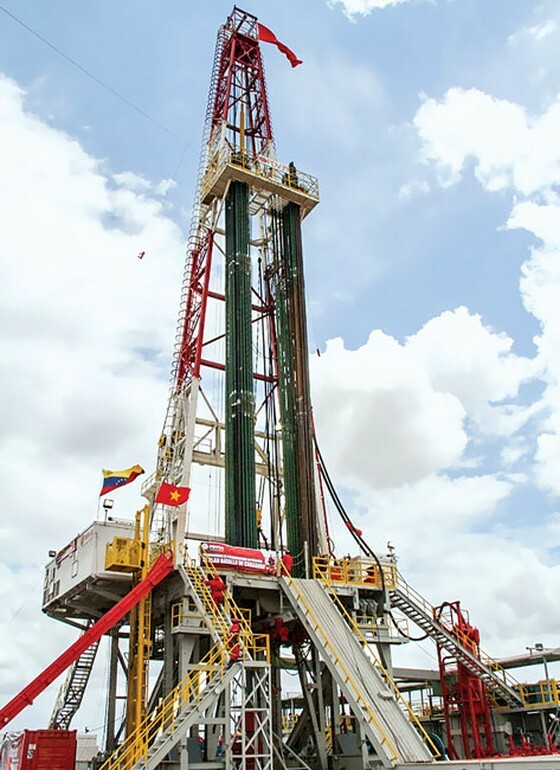 Rig PDV 39 at block Junin 2, Venezuela. PDVSA was seen as another government within the Venezuelan government. The raison d’etre of this company was more social than economic. Most of its petroleum revenues were transferred to a fund called Fonden whereas previous governments transferred them to the central bank. Thus, when oil exploration facilities were damaged, there was no money left for repairs and upgrades. This caused a drop in the company’s oil production. The situation could have been different if the oil revenues had not been used for social expenditure. After the global recession in 2008, oil prices plummeted from US$150 per barrel to $40, worsening PDVSA’s financial status. There was much speculation about PDVSA’s ability to service debts including international bonds. In 2010, the total liabilities of this company were $21.9 billion, including $9.3bn payable to suppliers. With such a financial position, how could PDVSA invest in the PetroMacareo JVC as scheduled? Why PVN invested in Venezuela? Considering all this, would any rational investor dare to invest in Venezuela? Oil exploration and production is always a high-risk industry. This factor, combined with the bad economic and political situation in Venezuela in 2006-10, worsened the risk and made things even more unpredictable. At the time PVN was invested in Orinoco in 2010, PDVSA also had five other JVCs with companies from the US, Russia, China and other countries. PVN, like the other partners of PVDSA, could not have been oblivious to these risks. Of course, we all know the ‘high risk high return’ rule of thumb. Monaldi of Rice University said the opaqueness and low credit rating of PDVSA and the Venezuelan government also offered big opportunities to investors. This might be an explanation for the investment by oil industry behemoths in Venezuela: they were either looking for windfall profits or had non-economic goals. If PVN had followed this philosophy when investing in Junin 2, the failure is acceptable. However, PVN is a state-owned company, and hence no Vietnamese taxpayer could have been happy with such a high-risk investment strategy. In 2010 PVN claimed “Junin 2 has low risk and its breakeven period is 7 years”. It means this was not a risky venture or an investment for political reasons: It was simply an attractive project. It also mean that the bad economic and political status and poor financial condition of PDVSA had little or no impact on Junin 2’s capability to earn profits. It is hard to understand this logic. In his book The Art of Thinking Clearly, Rolf Dobelli cites an example of the sophism of sunk costs during the Vietnam War. According to economic theory, sunk costs are expenses in the past and should not be taken into account when making future investment decisions. The US government poured more money and lives into the Vietnam war to mitigate the losses they had suffered earlier. But the result was worse and this is a typical example of the sophism of sunk costs. According to a 2012 analysis by the IMF of financial practices in the petroleum industry, the signing bonus is a sunk cost designed to protect the host country while putting the investment partner under greater risk. PVN explained that the signing bonus is a normal practice in oil exploration. But the IMF study found that only 20 percent of transactions involved a signing bonus. Hence, a signature bonus has to be carefully considered before making an investment decision. Clearly, if PVN had been private, the market would have required all information to be made public and transparent, and it would have been hard to get shareholders’ approval by using the sophism of signing bonus unless it was a venture capital fund.